DPlot is a Windows program that lets technical writers create presentation-quality graphs from a wide variety of data sources. Whether you're a software developer, a scientist, an engineer, or an educator, your technical writing will benefit from DPlot's powerful graphing capabilities. A few decades ago, low-quality graphs were sufficiently compelling to be used in technical writing. The people who read today's technical documents, however, are used to seeing presentation-quality graphics in every medium, from fast-food boxes to local TV news. Technical writers need more sophistication in their documents and reports if they hope to keep their stakeholders' attention. A few specifics related to published documents are shown below. 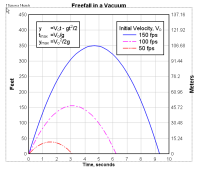 DPlot gives technical writers the highest quality, most accurate graphs that are available on the Windows PC today. And by using captivating graphics in your reports, documentation, presentations and other work products, you can keep colleagues and managers interested in your work. DPlot turns team members into supporters, and turns prospects into customers. With DPlot, technical writers can utilize data files from a wide variety of sources, and turn them into graphs of all types. DPlot easily lays out the graphs the way your readers need them, and labels and annotates them. For added emphasis, it's easy to use photos or images as the background for your graphs. DPlot lets tech writers graph and manipulate 1-, 2-, 3-, and 4-dimensional data. If you have a spreadsheet file or an ordinary comma-delimited file that contains statistics by year, or any groupings of figures, DPlot can grab the data, and lay it out for you in a huge variety of graphic representations. DPlot's Excel add-in makes it simple for tech writers to move data in a variety of layouts from Microsoft Excel to DPlot. DPlot lets you display presentation-quality graphs in a number of graph types that are simply not available in Excel, including polar charts, triangle plots, Mercator projections, and grain size distributions. These graphs support the work of scientists, mathematicians, hardware manufacturers, and professionals in every technical and engineering specialty. Some of your colleagues and stakeholders learn well from your text alone. Others can grasp numerical and technical data more quickly if they see it displayed graphically. DPlot makes it easy for technical writers to turn data into graphics, effortlessly. Sometimes technical writers need to create stunning contour plots of 3- and 4-dimensional data. Other times, a bare-bones chart can tell your story much more effectively than words. DPlot can meet all of your graphing needs. 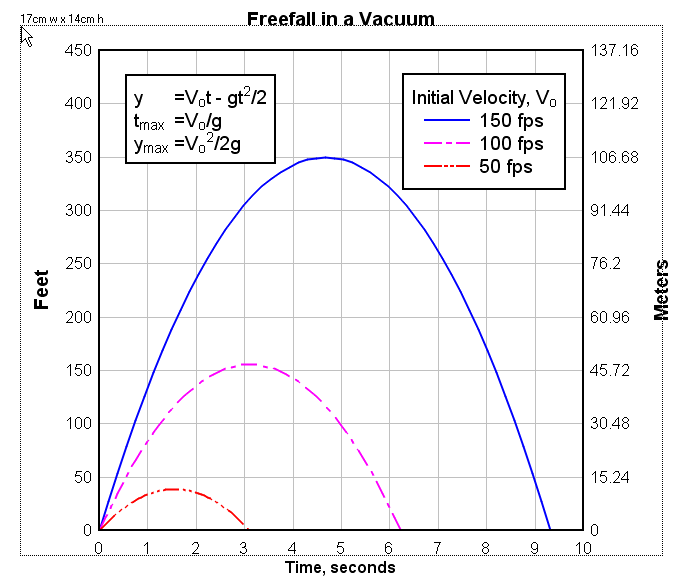 If you're working on technical writing projects for hardware manufacturers, software developers, scientists, engineers, or educators, DPlot can help you illustrate specific functions and formulas effectively. In addition to your technical writing, DPlot can enhance your proposals, journal articles, status reports, and project summaries. Customers and prospects are not technical writers' only target audiences. Your writing will be examined by stakeholders as diverse as government regulators, potential investors in your company, and journalists who can help you educate the public. Impress all of your stakeholders by delivering numerical information clearly, graphically. Whether you're writing a manual to accompany a high-tech machine, or creating the user manual for a new software application, DPlot can help you create stronger visual images. A single-user DPlot license costs $195(US), and will improve all of your technical writing projects now, and for years to come. In this context "bitmap" refers to BMP, GIF, JPG, PNG, and/or TIFF image files. DPlot supports export to all of these formats. When you elect to save a graph to one of these formats, you will be presented with the dialog box shown on the right. 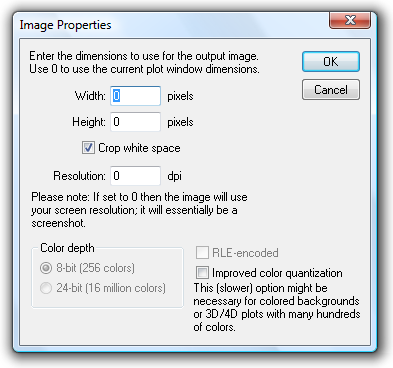 The output dimensions are controlled by the width, height, and resolution settings. If all 3 values are set to 0 then the resulting image will essentially be a screenshot. 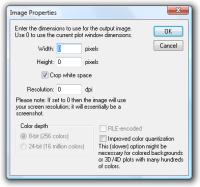 If resolution is non-zero, then all graph attributes as they appear on the display will be scaled by resolution/(display resolution), so that the graph will have the same proportions in the saved image as on your display monitor. Though DPlot does not directly support output of the PDF format, you can "print" to a PDF file using Adobe® Acrobat or any other Adobe product that includes Acrobat Distiller or the Adobe PDF virtual printer driver. If you have Acrobat installed you should see Acrobat Distiller and/or Adobe PDF as one of the possible choices of printer in DPlot's Print dialog. If you do not have access to one of those Adobe® products, there are several low-cost PDF virtual printer drivers available on the internet. For more information on PDF output see the FAQ (Frequently Asked Questions). This example PDF file was created with one of the PDF virtual printer drivers described in the FAQ. 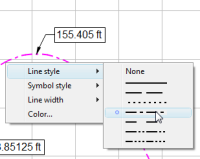 You can control the physical dimensions of a graph by selecting the Extents/Intervals/Size command on the Options menu and checking the Specify Size box. When you do this, the graph will always retain the same proportions, regardless of the extents of the device. The size specified in this dialog is the width and height of the box around the plot, not necessarily the entire graph extents. 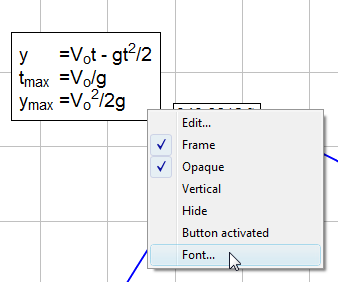 If you also check the Specify extents and Specify interval boxes then you can control the physical distance between grid lines and/or tick marks. 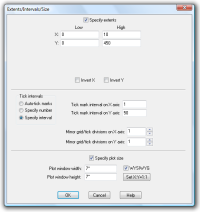 In other words you can use DPlot to print a ruler, accurate to your printer resolution. Alternative to the Extents/Intervals/Size command, you can set the physical size of 2D plots by dragging one of the plot corners. Dimensions are displayed in the default units set with the General command on the Options menu. 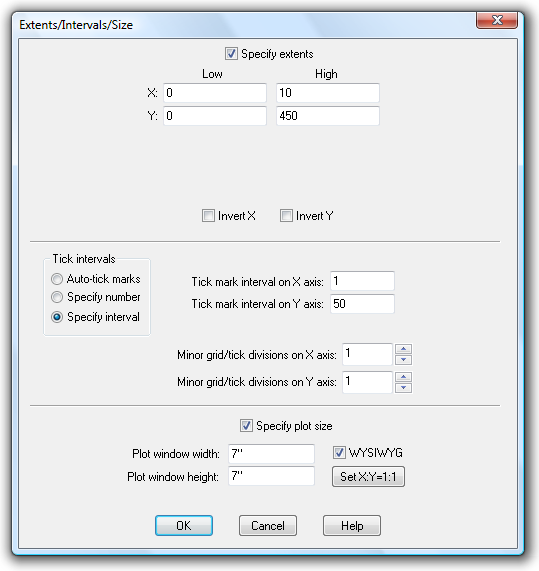 If you specify the physical size of the plot using the Extents/Intervals/Size command described above and that size will not fit within the output device extents (printer margins, for example), then DPlot will scale the graph down such that it will fit, and use that same scale factor for all fonts, line widths, symbol sizes, etc. In this way DPlot ensures that the graph has the same appearance on all devices. 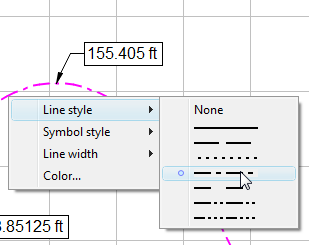 You can control the line weight, line style, symbol size, symbol style, and color used for any curve on a graph by right-clicking on the graph and selecting the appropriate menu item. DPlot includes 7 line styles and 40 symbol styles. You may also select any of the characters from the Wingdings fonts to use as a symbol. Each of these attributes are also accessible via toolbar buttons and commands on the Options menu.